It’s easy to get overly excited about development camp. Any group of highly skilled, largely NHL-caliber hockey players will typically look pretty good working through drills. Especially small-area skill drills with minimal defensive challenge. There’s plenty to glean from the week as fans, media and coaches have the opportunity to see players perform in a variety of settings but crowning greatness from the endeavor can be tricky. I’ve been guilty of taking too much away from the camp myself. Back in 2012 I was convinced that Judd Peterson was sure to be a late-round gem due to his development camp performance. Since then I’ve tried to avoid falling into the same trap. I’ve found it helpful to focus on individual growth and skills rather than trying to project any sort of impact onto the Buffalo Sabres roster. In other words, I’m not trying to name an MVP based on the stickhandling drills they did on Friday. There are some obvious caveats to this. Casey Mittlestadt’s coming out party last year helped to erase some of the doubts people had about him heading into the draft. 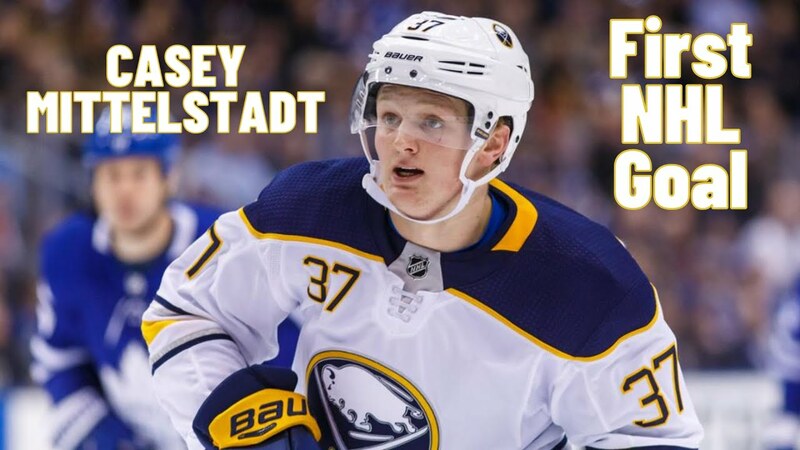 Even just a few weeks removed from his draft Mittelstadt was among the most skilled players at the camp and his play certainly inspired confidence in the fanbase, and perhaps the organization as well. But there are just as many cases where an impressive camp performance won’t accurately reflect where a player stands organizationally. So I try to keep that in mind when attending camp. With that in mind, I’m going to try something a little different with my round up. This will be more of a notebook, touching on players who showed either growth or intriguing upside based on their play. Far and away the biggest standout from Saturday’s tournament and probably among the top three-to-five performers from the week. His silky hands were on full display and he took over the contest after his team went 1-2-0 in the round robin portion of the tournament. A player of Mittelstadt’s ilk is going to have an easy time going against some of the invites you typically see at a development camp, especially from a skill and playmaking perspective. Above and beyond his highlight reel I noticed a few instances where his strength appeared to be at a higher level than those he was competing against, or at least improved above and beyond his draft year. One instance that stood out to me was during a one-on-one drill with Mattias Samuelsson where Samuelsson tracked Mittelstadt down to push him wide and negate a scoring chance but Mittelstadt put his shoulder down and managed to shrug off the much larger defender and get the puck on net. There’s still plenty of progress to be made there, but you can see he’s benefited from working with the University of Minnesota and Sabres strength and conditioning staffs. Guhle is always eye-catching thanks to his skating skill and he was all over the ice again during the tournament. There were scant few opportunities for any of the defensemen to really defend so it was hard to catch Guhle in any settings where you’d be able to figure out if he’s made additional strides. Not in a traditional sense, at least. What Guhle did display was his tantalizing straight-line speed and a high effort level in chasing down attackers and creating more than a few scoring chances for himself. Guhle’s work earned him the Craig Ramsay Leadership Award, a well-deserved honor for one of the camp’s veterans. Everyone trekked to Harborcenter during a sunny week (minus Wednesday) in June to get their eyes on Rasmus Dahlin. And he didn’t disappoint. There were countless tweets and video clips of Dahlin’s play throughout the week’s drills. It looked like Saturday was going to offer more of the same after he rang a shot off the crossbar on the opening shift. Dahlin hung in the weeds, slid around Matej Pekar to open a look in the slot but got bar instead of the upper 90. But he didn’t get too many more offensive looks after that. He looked to stickhandle on quite a few looks in the zone, probably a few too many times. He even caught the shaft of Ukko-Pekka Luukkonen’s stick a few times, leading me to believe he was an inch or two from adding a goal or two to his tally. He was far from perfect though. Pekar undressed him on a pretty move to create a goal and Dahlin wasn’t the dominant force I presume fans thought they were going to see. Dahlin’s lack of offense will certainly disappoint some people who were expecting to see a player with all 99 ratings in NHL 18 but some of his greatest traits were on still display throughout Saturday. He had more than a few impressive passes, finding openings you wouldn’t expect him to look to. He was a one-man breakout on multiple occasions, displaying impressive patience and vision in getting out of trouble. Exactly the type of thing the Sabres have been lacking. Remember how I said not to read too far into things? About that. In the sessions I managed to see Hickey compete in I was astonished at how talkative he was. More so than most guys I’ve seen in this type of setting. Always chatting with the goalies or teammates after a rep and he even shouted “good stick” to an opponent during Saturday’s scrimmage. As far as potential free agents go, he certainly seemed to be very comfortable in Buffalo. There’s no correlation between that and whether or not he’ll sign a contract but I still found it interesting. Hopefully it’s a good sign. His skating is a real asset and although you’re not going to confuse him for Brent Burns, he was making smart plays off the rush and displaying the ability to make a good first pass. I really hope we get to see him develop with the Sabres over the next few seasons. Borgen is billed as more of a traditional defensive defenseman and he’s gotten plaudits for playing with an edge as of late, something that was on display this week. But the one thing that always has impressed me about him at these camps is his overall mobility and willingness to activate up into the play. Whether or not Tim Murray and his staff identified Borgen’s skating as a trait that would be valued down the line, he appears to fit the profile of the type of defenseman teams are working to cultivate. One way or the other, it’s made Borgen an asset to the organization and it’s going to be nice to watch him continue to grow with Rochester this season. UPL turned heads last year with orange pads and a week of very strong play. He was a popular topic again this year after being selected third in the CHL Import Draft by Sudbury. Now there’s a question as to where he’ll play in 2018-19. There are pros and cons to both Sudbury and HPK as development options. The CHL route keeps UPL closer to Buffalo and on the North American ice surface. HPK is a pro league with pro shooters. Both teams offer plenty of opportunities for big minutes, although Sudbury probably offers the chance to be the standalone starter. It will be an interesting decision for the Sabres and UPL. His on-ice contributions this week weren’t quite as electric as 2017 but most of the drills done from Wednesday to Friday were one-on-one shooting drills. He was working in some new Bauer 2S gear during the week and he didn’t seem to be quite as mobile in the crease with the new pads. He switched back to his infamous orange CCM pads on Saturday – a pad with a softer construction – and he looked far more comfortable as a result. He looked like the goalie who caught everyone’s attention last year, playing in control throughout the scrimmage and there was a time where it seemed like he was going to carry his team to the final. I’m a big fan of UPL’s game. He rarely out of control and tracks the puck extremely well, I hope he makes the right decision for his development this season so he can continue an upward trend towards becoming an NHL goaltender. You might hear people talk about Olofsson’s release and feel that they’re exaggerating. Reader, they are not. Olofsson comes as advertised. To say his shot is effortless is somehow an understatement. What’s more is that he displayed plenty of other traits – slippery agility, silky hands – that might lead you to believe he’s not a one-dimensional sniper. Olofsson had a pair of highlight reel goals on Saturday, one in which he dangled through the entire white team and beat Jonas Johansson over his glove. The other and the one that wowed me came with Olofsson bearing down his off wing and picking the far corner on UPL with an incredible shot. Olofsson’s growth has been great to watch, he’s going to be a terrific addition to Rochester’s lineup and I’m almost certain you’ll hear calls for him to start in Buffalo should he get into a few preseason games. Out of the forward group, Oglevie, Rasmus Asplund and Matej Pekar were consistently around the puck throughout Saturday’s scrimmage. All three were active on the forecheck and made some trouble for whatever team they were facing at the time. Oglevie also had a penchant for finding open ice in the offensive zone, working off his teammates cycle to get open for quality scoring chances. It resulted in a few pretty goals for the free agent from Notre Dame. I’m interested to see how his speed helps his game translate as the regular season rolls around and he’s plugged into the Rochester lineup. As far as camp invites go, there aren’t too many guys who wind up as long term targets. Drake Caggiula comes to mind in this regard. But there aren’t too many other examples of camp invites I’ve hoped to see the Sabres sign in the future. Shepard and Kielly both posted impressive numbers in the NCAA last year, with Shepard boasting an NCAA title on his resume. Kielly spoke with John Vogl of The Athletic about his communication with the organization which leads me to believe the Sabres are going to be watching these two invites a lot closer than others. Shephard stole the show on Saturday with a half-dozen acrobatic saves throughout the tournament. Shepard is the more active of the two as Kielly is a bit more efficient and conservative with his movement. As a result Shepard will stand out a bit more. He has a little Jonathan Quick in his game. But don’t think that the lack of split saves sets Kielly back. He uses his size well and both are strong goaltending prospects. For a team with a barren goaltending pipeline, either would provide the Sabres a quality addition come springtime.